WEST Performing Arts ad for the "Academy at WEST" summer classes. 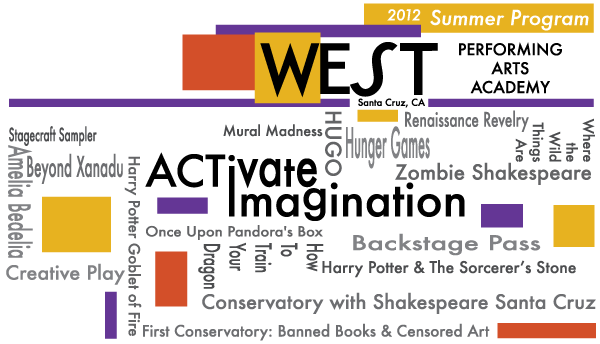 West End Studio Theatre has released their summer 2012 schedule. They have 19 programs that they are running this summer. Each program has a specified age or grade range (ages 4–7, grades 4–10, grades 7–12, ages 14–21, and so forth). The age range, when all the programs are combined, is 4–21, and I know that they hit both ends. My son usually does 2 or 3 programs with them each summer. This year he is planning to do the Teen Conservatory Scene Study Intensive, which is lead by professional actors from Shakespeare Santa Cruz, and the Hunger Games teen production. He hasn’t decided about the other teen production yet, Beyond Xanadu, though there is a $100 discount if you register for both teen productions at the same time. He’s done the Shakespeare Santa Cruz Conservatory for the past 2 years, and it was quite different each time. He’s expecting another quite different 2 weeks this summer. I was pleased to see that WEST had taken a full-page color ad on the back page of the April edition of Growing Up in Santa Cruz, which is the issue that list local summer camps. Although WEST has been growing rapidly mainly by word of mouth, I think that they have so much going on this summer that they may need the advertising to fill all their classes. I’m wondering if the theater classes (which will take up at least 120 hours) can be included on his official transcript for his home-schooling through Alternative Family Education. One of my former students recently pointed me to the following Kickstarter project in Santa Cruz: earth • science • art / sixteen collaborative explorations by Lisa Hochstein. A group of artists are collaborating with scientists of the USGS (who happen to share the Wrigley building with a gallery) to do an art show inspired by the research the scientists are doing. The show is 2012 June 1–28, in the R. Blitzer Gallery. The gallery has apparently been open for about a year (many of the events in their “event archives” lack information about what year they were), but I’ve never been there, since it is tucked away in an industrial neighborhood on Westside. The Kickstarter project is not a make-or-break thing for the show—it will enable creating a 24-page catalog for the show and help cover artists’ costs of materials. I donated a bit to the Kickstarter project anyway—it seems like a worthy project. On one of the e-mail lists I subscribe to, parents were asking about tools for teaching math to “visual-spatial” kids. Let’s ignore the controversy over whether learning styles should be associated with students or with topics, and treat the question as one of finding particularly visual approaches to teaching math. Geometer’s Sketchpad was mentioned as was Geogebra. 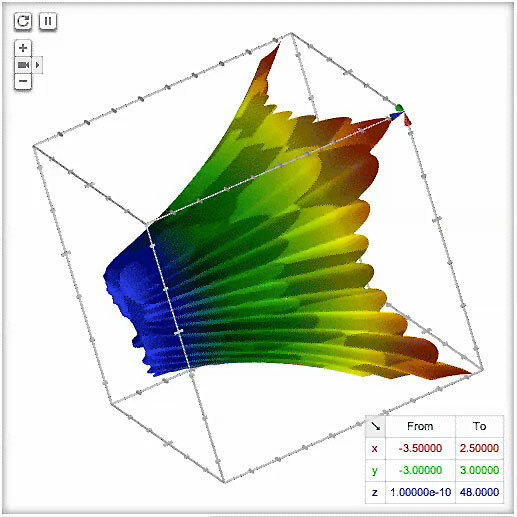 From what I’ve seen in teacher blogs, Geogebra has much more traction in the math teacher community, because it is free (while Geometer’s Sketchpad costs $30 for the student edition), and there has been a lot of sharing of teacher-created lessons. Note that none of these is a full math course. Geogebra is intended as a tool to supplement learning, not a replacement for a standard math curriculum. Still, there are a lot of lesson plans using Geogebra available, at all levels from elementary school through college math, so finding materials to make a math course more visual and interactive should not be hard. Less often done, but probably more valuable for “mathy” kids—having a student learn to program Geogebra applications would also strengthen their algebra and geometry. Perhaps when my son has some spare time (not until June, probably), I might have him look into learning Geogebra. There do seem to be a few things he can do with it that would stretch his math skills a bit. Graphing on Google.com – Now in 3D – Inside Search. I looked a little at the Arduino environment, and it looked like it might be an ok transition from Scratch programming (which Waterbear’s interface is modeled on) and programming the Arduino with a text-based editor, particularly for people who can’t type well. Unfortunately, Waterbear is just a text editor—it does not appear to include the compilation, linking, download, and serial communication of the Arduino environment. In this it does not include some of the best features of Scratch as a programming environment, where any block of code can be executed directly from the edit window. I don’t think that Waterbear will sweep the Arduino community, though. The number of blocks needed to include substantial parts of the library is huge (at least with the current design), and Waterbear is not well set up for typed variables. I believe (without strong evidence) that learning the syntax and using a text editor is not a major burden for Arduino programmers, once they have sufficient programming skills to be able to use the Arduino effectively. The Scratch-like interface is great for a first introduction to programming, but programming the Arduino is not a good choice for that first introduction. Waterbear might help, slightly, with making the transition from a Scratch-like editing interface to a test-based editing interface, but I don’t think it is worth the trouble.